Get access to 21 million Australian and 4.1 billion worldwide Internet users. Expect half the website traffic to come from tablets and smartphones. 4.1 Billion Internet Users Expand your business reach globally. Reach up to 21 million Australia's on the Internet. 3.5 Billion Google Internet searches per day Which customer search phrases would suit your business products and services. Build content to suit your client's needs. Have an online customer segment Start a new online customer segment to work with your physical store or warehouse. Create more turnover using existing buildings. Create a sales funnel Create a website for product awareness, product evaluation and product selection. Save time with customer development. Provide new methods of customer contact Allow customers to contact your business 24/7. Create online sales, enquiry forms, email contact, online payments, online appointments etc. Use Google Maps with your website Link your Google Map entry with website and contact links. Draw new traffic via Google Maps and then your website. New website traffic with images New Internet traffic can come to your website via image searches and your image ALT descriptions. Social Media to your website Social share your website web pages. Expand you website reach using social media. e.g. 15 million Australian Facebook users. Complimentary marketing Add your website address to your stationary, email signature block and physical marketing campaigns to extend its influence. Pay Per Click ads to website Create specific online ads to point to specific website pages. Create 1000's of your business ad impressions for free and low cost clicks to your website. Website Landing Page Have a web landing page with opt-in form to collect a prospect email address in exchange of a lead magnet. e.g. Competition, report, eBook etc. Create an automatic follow up email sequence for the prospect with information and offers. Provide Digital Products Some digital products can be sold online automatically with digital delivery. This required a product page with ordering facilities, payment handling and a link to download the digital product. New sales can operate 24/7 without extra inventory. e.g. eBooks, reports, business documents and software. Business Contact Details Provide maps, address and phone number for your customer before visiting your physical business. Assist smartphone users find your business. 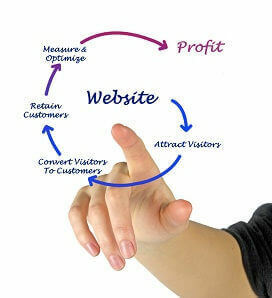 Website Backlinks Raise your website authority and traffic with backlinks from other websites. e.g. LinkedIn company page, Industry associations, your awesome content shared by others. Affiliate Links Pay a commission for traffic to your website that results in a sale. Earn commissions for traffic to other sites of complimentary products that result in a sale. Advertising income Earn extra income with ads on your website. Ad units can include similar products on your website and other websites. You allocate the space and the ads are put in automatically. eCommerce Sell physical and digital products globally. Ecommerce products can be displayed on your website, Amazon, Shopify, Google Shopping and your Facebook pages. Subscriptions Create a service or membership website that requires a subscription. E.g. Software as a service, specialist industry site, training site, online magazine etc.